Paul Dekar’s book, Community of the Transfiguration: The Journey of a New Monastic Community (Cascade Books, 2008), maps the historical, theological, liturgical and missiological life of Holy Transfiguration Monastery [HTM], or what many of us know better as The Breakwater Community – a Baptist monastic community in Geelong, near Melbourne. HTM was birthed in the early 1970s and bound together by ‘a common calling to contemplative prayer, simplicity, a Eucharistic focus, and the nurture of monastic spiri­tuality’ (p. 33). How this birth happened, and the shape that the life birthed has taken, and is taking, is a focus of this book, but by no means the only focus. Dekar, who is Professor Emeritus of Evangelism and Mission at Memphis Theological Seminary and (as I understand it) a ‘Companion in identifica­tion with HTM as a spiritual home’, locates the story of the Breakwater Community among the wider stories and history of Christian monasticism in both its ancient and contemporary forms: ‘HTM exhibits many generic traits of its monastic forebears and of the new monastic communities. These include the centrality of Jesus Christ, communal life under a rule of life, vital worship, use of the visual arts, care for youth, care for the natural world; and ministries among marginalized persons. In this sense, the life of Community mem­bers is neither unique, nor original, perhaps only “newly born … a spirit and an endless trying, changing and beginning again”’ (p. 57). 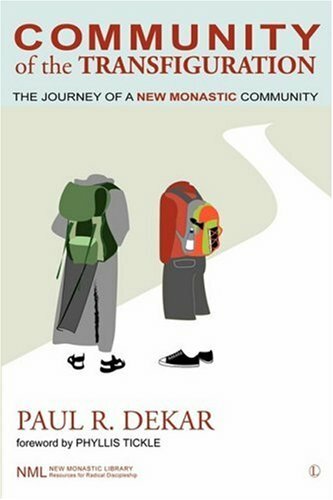 That the members of the Community have sought to explore and live out of traditional monastic spiri­tuality for over thirty-five years has, in Dekar’s words, ‘made the Community somewhat of a working model, or bridge, between past and contemporary forms of monastic religious life’ (pp. 61–2). Dekar believes that ‘the radical love Community members have extended to lay people, pastors, denomi­national leaders, critics, and even enemies is perhaps its greatest gift’ (p. xvi). That I can count myself as one among many who has been, on more than one occasion, the recipient of the hospitable love of this extraordinary and permission-giving community (once in the form of home-made lemonade and a pumpkin – food for the journey, so to speak), is but one the reasons that I was so keen to read this book. But from my brief experience and observation as a former pastor in the Baptist Union of Victoria, among the greatest gifts bestowed by the Breakwater Community to the wider Church is the centrality, rhythm and theological maturity afforded to gathered worship, and the attendant invitation to live all of life as an expression of and participation in the One who gives himself in the eucharist. It is, I believe, appropriate, then, that Dekar devotes a significant portion of the book to introducing readers to some of the liturgical resources and prayers authored by the Community, and to outlining the theology and practice of HTM’s worship, the shape that a community in which ‘the nurture of warm, personal intimacy with the Holy Trinity’ (p. 89) lies at the heart of common life. On occasion, Dekar gets sidetracked from the main story and expends ink on some of his additional interests which, although loosely related to the book’s subject, disrupt its flow. Still, this moving and challenging book records a fascinating and important – albeit small – chapter of the story of Victorian Baptists, and locates that story in both a wider and more grassroots ecumenical and catholic context. Those already familiar with the inspirational life and witness of the Breakwater Community and its relationship with the Baptist family in Victoria, and those interested in hearing a more-detailed account of one community that religion sociologists might locate in a movement known as ‘New Monasticism’, will find much of interest here.